A very special Latviešu Dienas Edinburgā 2019 indeed! If you missed it, Latvian Cultural Days came to Edinburgh with the celebration of Latvia’s 100 years of independence. Festivities started on Friday 5 April with a Ceilidh with Latvians, a fun evening of cultural exchange, opening celebrations and – of course – dance. The celebration continued in the form of a Saturday Parade, which we were lucky enough to attend! 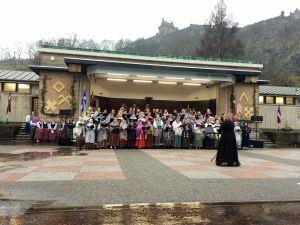 Latvian culture and pride were on full display as the community marched from Edinburgh Castle down the mound to the Ross Bandstand. With a concert on (pictured below) and a Craftsman’s Fair at the back of the amphitheatre, residents were able to celebrate their culture in style. Saturday night saw an End of Festival party fit for Latvians and Scots alike. Celebrating Latvian identity, multiculturalism, and great Latvian musicians. Band Grupa CREDO and Latvia Folk band Austrumkalns graced the stage! With a buffet dinner and two operating bars at The Hub, makes you want to mark it for next year! While the Latvian flag was officially reinstated as late as 1990, the origin of the flag is one of the world’s oldest! Dating back to the 13th century, the design symbolises an ancient Latvian Legend. The story is of a Latvian Chief who dies in battle and is wrapped in white sheets, whose bloodstains are now depicted on the flag. As shown during Edinburgh’s Latvian Days, Latvian clothing is vibrant and generational, with women’s garb consisting of a skirt, blouse, head scarf, and shawl. Typically worn as folk costumes at festivals and performances, their style has lasted through the ages. 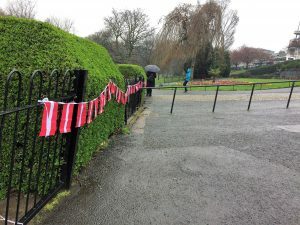 Most importantly, know that Edinburgh has some outstanding Latvian Pride!